Who doesn’t love the first scent of rain falling on mud! In fact we even have a technical word for this scent – Petrichor, derived from Greek mythology. This fragrance brings with itself bundles of fresh energy, rejuvenates the tired minds & souls, and lightens the mood. This earthy, sweet, dusty, musty aroma had a scientific reason behind it. Plants secrete special Oil during parched periods to tale off the competition by preventing additional seeds from developing at this time. This oil is absorbed by the concrete and earth, when the rain droplets come in contact for the first time; some of the chemicals are released leading to this unique scent. Surely there is nothing bad about these rains right, But what about consistent and treacherous rains pouring down for days and hours together. It bring with itself challenges like traffic snarls, water logging in drains, water borne diseases, illness due to weather change etc. Another major impact that this accumulated water can have is to cause corrosion and seepage into the rooftops or the building corners. In order to avoid this, we build narrows pathways for the water to collect and flow away from the concrete edges. This channel is termed as a Rain Gutter, Dripster or even a Gutter. These can be installed by individuals at home and come in standard lengths and width. These have a continuous roll and need to be installed by contractors. A gutter instilled within the assembly of the roof. It is also worthwhile to mention about Finlock (Concrete) Gutters, which are although not used anymore, but were a big hit in early 1950’s and were widely accepted. The standard rain gutter sizesare of “U” shape & “K” type, possessing an ogee-shaped front loosely reminiscent of the alphabet “K”. These channels vary from 4 to 6 inches in diameter, with 5 inch K-Style gutters being the most popular ones. Corresponding downspouts are of 2” x 3” or 3” x 4” rectangular / circular profiles. Best rain gutters are generally considered to be the ones that are big in size & covered on top as clogging of these gutters is quite common and cleaning is equally cumbersome. One common question asked these days is what are Seamless Gutters? We agree that all houses are built in different shapes and sizes. Apart from the standard shapes and sizes, modern technology has also come up with techniques to create unique continuous gutters without any actual joints. These use the Cold forming technology and reduce the joints hence reducing the chances of clogging & leakage. These are created on-site and hence can be made as desired. Another point to consider here is – how to hang gutters? This should be done with hidden hangers, straps & brackets. A crossbar hanger is also commonly used and quite durable. While installing gutters in households or building, ensure to create a slop of at least 0.5” for 10 feet length towards downspout. For lengths over 40 feet, either install the gutter from center to downspout at all ends or just slope it from all ends to one downspout placed in the center. 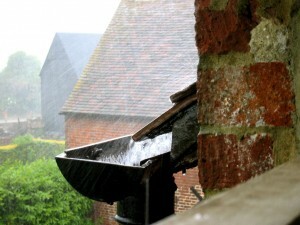 Rain Gutters are an absolute necessity these days and it’s better to look at them as an investment rather than expense. If possible, always go for bugger size gutters to avoid the hassle of choked pipes. At the end, determine what is best for your construction and then order accordingly rather than just going by what has worked for some other structure.